Cross Counter secured his place in the record books as he became the first British-trained winner of the Lexus Melbourne Cup at Flemington. Trained by Charlie Appleby and ridden by Kerrin McEvoy, Cross Counter swooped late to grab the Group One prize in the famous blue silks of owners Godolphin. Fellow British runners Marmelo and Prince Of Arran secured the minor honours in a clean sweep for the raiding party. Runaway set the early pace in the two-mile contest, with McEvoy content to sit towards the rear of the field and he had only a handful of horses behind him turning for home. He had to switch wide to launch his challenge in the straight, with the Charlie Fellows-trained Prince Of Arran having set sail for home. However, Cross Counter was flying in the final furlong and while Marmelo also tried to produce a winning sprint, he had no reply to McEvoy's mount. The Aidan O'Brien-trained Rostropovich finished fifth, but fellow Ballydoyle inmate Cliffsofmoher sadly suffered a fatal injury passing the post for the first time. McEvoy said: "What a thrill - to do it for Sheikh Mohammed and Charlie Appleby. Obviously Godolphin has been a huge supporter of mine. Well done to Charlie and this little horse. "I was back a little bit further than I wanted, I knew I was full of running and at the furlong I thought 'is this happening again?'. 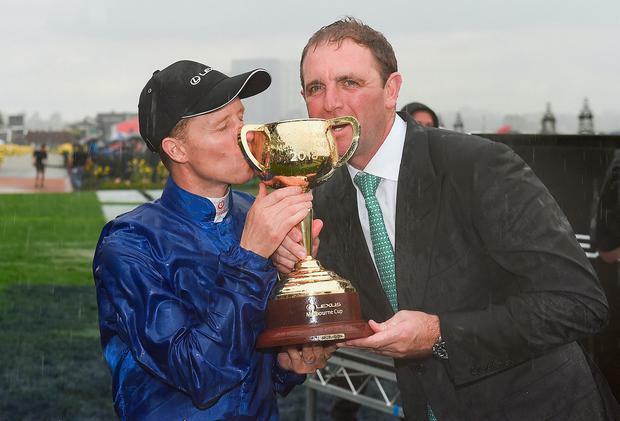 I'm just lucky I can ride light and he's been unbelievably well prepared by Charlie Appleby." Appleby has enjoyed a stellar year with Masar also winning the Derby at Epsom back in June. He told Channel 7: "It's a very special day for us all. "For me it's obviously very special to be here, but for the team, it's just fantastic. I've spoken to His Highness (Sheikh Mohammed) and he's over the moon about this result - it's a challenge that's been a long road. "I can't thank everyone enough. It's a day I will never forget. It's been a very memorable day." Marmelo's trainer Hughie Morrison was thrilled with his charge's run, but felt a 9lb difference in weight had been crucial. Morrison said: "We thought we nearly had it as I think Charlie (Fellowes) did. It's a great result. It was a great ride - what a horse. "We'll try to find something (for next year). We'll see how he is. He has run his heart out and he was beaten by a three-year-old weight for age basically." Jockey Hugh Bowman added: "He ran his race. I'm disappointed but proud of the horse and congratulations to Hughie for bringing him over in such good order." Prince Of Arran only secured his place in the race with victory in the Lexus Stakes at the track on Saturday. Trainer Charlie Fellowes told ww.racing.com: "(That was) an unbelievable run. For a horse to run three days after running over a mile and a half and winning, on ground that we know is not his cup of tea. It's unbelievable." Jockey Michael Walker felt Saturday's exertions had perhaps told on Prince Of Arran at the finish. He said: "He's all heart the horse, I couldn't have wished for a better run. At least I've got a top chance for next year and I believe if he hadn't run on Saturday, he'd have won today." Wayne Lordan was more than satisfied with Rostropovich's effort, adding: "He ran very well, I'm very pleased with him so a good day." Yucatan was a third runner for O'Brien, finishing 11th in the hands of James McDonald. He said: "He worked into a nice spot from the gate, he travelled nicely but I felt he just didn't stay the two miles." Godolphin fielded three runners in total, with Best Solution finishing eighth for Saeed bin Suroor under top weight after a tardy start. Jockey Pat Cosgrave said: "He was slowly away and we were playing catch up after. He was too far back." The Ian Williams-trained Magic Circle was one of the favourites for the race, but was well beaten in 16th place. Jockey Corey Brown said: "I was disappointed. I had a great run from the barrier, but he never gave me a kick at all." Williams later tweeted: "In a post race scope, Magic Circle was found to of broken a blood vessel during today's Cup. I hope he has a speedy recovery." Muntahaa finished ninth for John Gosden and Jim Crowley, who said: "He didn't really travel, I thought he'd have been a bit keener than he was. "The ground had maybe gone a bit soft for him." Nakeeta finished fifth for Iain Jardine last year but was only 12th this time. Rider Regan Bayliss: "He gave me a lovely ride throughout, I was still travelling at the 600 (metre marker) right through to the 400. It was a gallant effort."